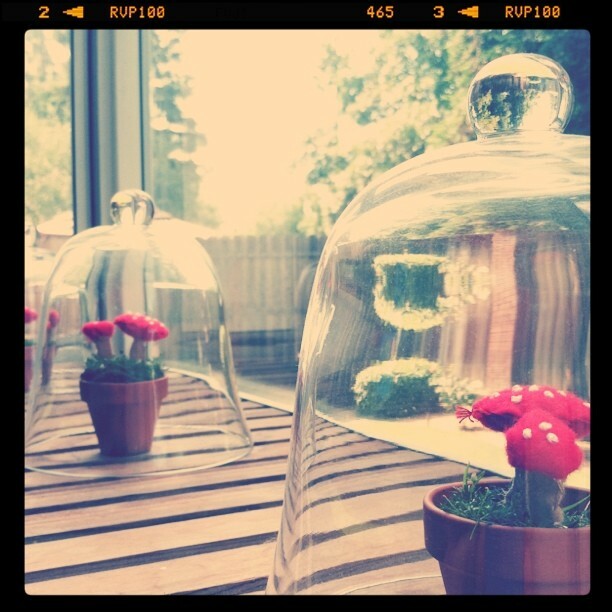 i've had these glass cheese domes for a while with nothing permanent in them. i've been wanted to make some felt toadstools for them for a while and i finally got around to it. the red felt makes me cringe a little because it doesn't match any of the colors in my house, but they look more traditional and i love the pop of color in my bay window so i think i can get over it. each toadstool is two red circles with white french knots, stuffed and sewn together. i used a rectangular piece of tan felt for the stem and sewed it in a tube shape and stuffed it before attaching it to the bottom of the toadstool. easy enough! while finishing up this project my son got very interested in sewing. i let him use my leftover scraps of felt and embroidery thread to cut and sew a few pieces together. he was very serious about it, what a cutie! he made a little mobile o sorts and hung it from the top bunk to hang over his head. what do you think? i think they are adorable! Great idea! I love the red.